The Spa & Wellness Gift Card® is accepted at over 9,000 spa and wellness facilities across the U.S., Canada and Puerto Rico. The card never expires and has no added fees. More than just massages and facials…use the Spa & Wellness Gift Card to access thousands of services such as: o	Massages o	Facials o	Manicure/ Pedicures o	Haircuts & color o	Waxing o	Laser hair removal o	Botox o	Yoga/ Pilates o	Acupuncture o	Body Wraps o	Chiropractic sessions and more… Visit us today at www.spaweek.com to find the closest location near you. Usable up to balance to buy goods or services only at the participating spas & wellness facilities listed at spaweek.com. Fixed Denomination Cards - Valid for one-time use only. Once used, any remaining balance will be issued to you as a credit for use at the location where this card is redeemed. Not reloadable. All cards not redeemable for cash in New Jersey or for cash in any other state unless the state requires cash redemption. Not a credit or debit card. Safeguard the card. It will not be replaced or replenished if lost, stolen or used without authorization. Wellness Media Group, LLC ("WMG") is the card issuer and sole obligor to card owner. WMG may delegate its issuer obligations to an assignee, without recourse. If delegated, the assignee, and not WMG, will be sole obligor to card owner. Purchase, use or acceptance of card constitutes acceptance of these terms. For additional Terms & Conditions, Participating Locations and other inquiries visit: www.spaweek.com. Wellness Media Group, LLC is not a sponsor or co-sponsor of this promotion. 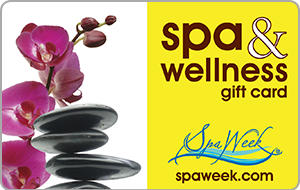 Please see gift card or visit www.spaweek.com for terms and conditions of use. Wellness Media Group, LLC is not liable for any alleged or actual claims related to this offer.